Argentina has long been one of the best, most feared soccer nations in the world. Playing in the World Cup is just what they do. The tournament this summer will be their 16th World Cup appearance and 11th in a row, but they haven't won it since Diego Maradona scored maybe the greatest goal of all time against England in 1986, and they haven't made the semifinal since 1990. As this year's host nation, Brazil didn't need to compete in South America's World Cup qualification. With Argentina's rival and strongest test chilling at home, La Albiceleste were expected to dominate the qualifying rounds. They did. Nine countries played each other home and away, and when the smoke cleared, Argentina were comfortably on top. In the end, they walked the competition, winning nine games and losing just twice. More important, though, was the progression, if we can even call it that, of Argentine captain and star man Lionel Messi. Messi has begun to be regarded as the best to ever kick a ball, and he is still somehow underrated as a player. This is partly because some people are dumb, and partly because as unstoppable as Messi is for club Barcelona, he hasn't been nearly as dominant with Argentina. And that's because the previous manager, Diego Maradona, didn't really know what to do with him. He fielded too many forwards, and Argentina resembled a lacrosse team, with a defensive unit, an offensive one, and only the thinnest semblance of a midfield. Spacing was ruined, and Messi languished. As the object of everyone's attention during the 2010 World Cup, he failed to score. It's different now. Sabella has found a way to use Messi, Gonzalo Higuaín, and Sergio Agüero, and Argentina boast the best attacking core in the world. On top of that, Messi's found his form, and has recorded 12 goals and seven assists in World Cup qualifying. This is important, because Argentina will go as Messi goes. The Argentines are considered one of the favorites in Brazil this year, but they always are. The problem, though, is that they always fail to live up to the hype. They were always expected to qualify. We just don't know what it means once they get to Brazil. Lionel Messi is the greatest player in the world. This is not a debate. There is a debate, however, to whether Messi is the greatest player of all time. He probably already is, and if he shows out this summer at the World Cup, we'll be able to put that to bed, as well. At his core, Lionel Messi is a dribbler, and it's his dribbling that sets him apart from every other player in the world. Much gets spoken about Messi's humility (especially in comparison to Cristiano Ronaldo's flash) but make no mistake—Messi's arrogance on the ball and his eagerness to run at and challenge defenses are unmatched. Playing as a false nine forward, Messi is asked to do everything at his club, FC Barcelona. He's expected to beat multiple opponents with the ball at a time, penetrate teams that have packed their own box to prevent this very thing, score every time he takes the pitch, and provide chances for his teammates. What's frightening is that he excels. Historically, Messi has been a hardy player who doesn't miss much time, but this year he's had to battle injury. As a result, he had his worst statistical season since he broke out in 2008. After scoring 46 goals and 12 assists in 32 La Liga games last season, his output dipped significantly; this campaign, he tallied "only" 28 goals and 10 assists in 29 matches. Barcelona struggled, crashing out of the Champions League quarterfinals to Atlético Madrid and failing to defend their La Liga title against Atlético on the final match day of the season. Still, WhoScored rated Messi as the second-best player in the world this year, trailing only Luis Suárez and above guys like Zlatan Ibrahimovic, Franck Ribéry, and Ronaldo. who have been doing whatever they want all year long. He's required to do much, much more than anyone else in the world, and he does it better. This World Cup, Argentina have given up all pretense of trying to field a balanced squad, and instead are throwing every attacking player they have out there at the same time. Manager Alejandro Sabella will have his team in a flowing 4-3-3. Messi will sit deeper in the formation, more similar to a classic number 10 role, and provide support for Agüero, Higuaín, and Ángel di María up front. He'll operate in gaps between the opposing defense and midfield, which is where he does his best work. But he'll also be called on to charge forward whenever he can, switching with Higuaín and Agüero and causing confusion in the defense. 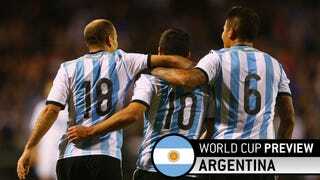 Argentina are selling out, and betting on themselves to overwhelm and overrun defenses. This shouldn't be a problem in the group stage, but like Barcelona, Argentina need their best player to be everywhere at once and dominant on the field, and unlock opposing defenses with his dribbling, deft passing, and cold-blooded finishing in front of goal. After years of spotty performances, Messi seems to finally be duplicating his club form for his country. If he's able to this June, look for Argentina to make a deep run in the World Cup. Ángel di María is a greyhound. For Real Madrid, he's asked to run up and down the field all game long and cover defensively for Cristiano Ronaldo and Gareth Bale, who don't defend and rarely track back. Di María's effort everyday is really the only way Madrid can justify playing both wingers along with forward Karim Benzema (and sometimes attacking midfield Isco, who also is a defensive liability.) For Argentina, he'll be asked to do even more. Argentina will most likely take the pitch in a narrow, shapeshifting 4-3-3. On defense, Argentina's formation most closely resembles a 4-1-2-1-2, with di María sliding into the midfield behind Messi. But when they have the ball, di María sprints up the pitch and flares out to the left. Agüero and and Higuaín push to the the right across the front line, with Messi playing behind them. It's insane to ask any one player to cover this much ground, but di María does, and whips balls back into the box for the waiting forwards, as well. He's devastating on the counterattack, which is a staple of Argentina's, and his transition from a midfielder to a left winger is almost impossible to track properly. With so many numbers forward, di María's presence creates situations where Argentina's forwards are in one-on-one situations or even outnumbering opposing defenses. Di María isn't the biggest name on the roster, but he'll be the one papering over all the team's well-known cracks. As a team, Argentina don't make much sense. Their attacking options—Messi, Agüero, Higuaín, Ezequiel Lavezzi, and Rodrigo Palacio—are hilariously good, and any combination has the ability to cut the world's best defenses to piece. The problem, though, is that their own defense is also kind of a joke. Goalkeeper is a problem area, as probable starter Sergio Romero doesn't play for current club AS Monaco, where he's on loan from Sampdoria, and is bad besides. Outside of right back Pablo Zabaleta, their back four doesn't instill much confidence. Javier Mascherano is a strong anchor in the midfield, but let's face it: their defense can be exploited. If they're to succeed in Brazil this summer, it'll be because their attacking players who will have to carry them. The problem was always how Sabella was going to get the best out of his team; he had too many attacking options to field at once. The previous manager, Diego Maradona, played a 4-1-2-1-2 , relying on Carlos Tevez alongside Messi and Higuaín, and Agüero largely featuring off the bench. But Tevez played terribly. What's worse, he largely occupied space that Messi preferred to move into, choking Argentina's best hope to win. They got through the group stage without a problem, but were absolutely destroyed, 4-0, by the Germans in the quarterfinal. This cycle, Sabella has found a way to feature Messi, Higuaín, Agüero, and di María. Though they're all forwards, Messi, Higuaín and Agüero are vastly different players with different strengths. Higuaín is a poacher and a target man, who can both hold up the ball and fight off opposing center backs, and can score from anywhere. Agüero is fast enough to come deep and carry the ball through the midfield, but he's at his best playing off defenders shoulders, getting into channels and wreaking havoc with his movement. Messi playing behind them, will interchange with either one, but as the number 10, will mostly play between the defensive and midfield lines, looking to pick the ball up, turn, and run at goal. It's a lot to invest three out-and-out attackers who don't defend, and playing winger di María further weakens Argentina's suspect defense. Di María is expected to get back and defend on the left side, as well as push forward and cross to the attacking trio. Di María is great in this role, but at times the team can get caught with too much space and get overextended. Argentina don't play safely. This team isn't even a particularly great possession team, which opens them up more. They're gamblers, and look to outrun teams and score on their terrifying counter attacks. They're daring to put their four attacking players against any defensive unit in the world. Most of the time, this is nonsense, but Argentina have enough talent for it to pay off. Group foes Bosnia, Nigeria, and Iran are all decent opponents, but Argentia will turn this group into a three-way fight for second place.